SORRENTO, Fla. -- If you like great greens -- and who doesn't? 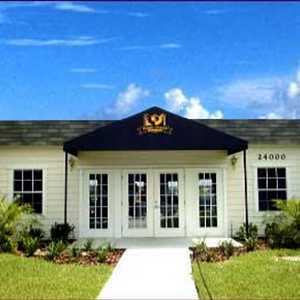 -- you'll love Eagle Dunes Golf Club. The view from the first tee at Eagle Dunes is memorable. Eagle Dunes Golf Club in Sorrento sprawls across rolling elevation changes that aren't typically found on central Florida courses. The course also claims to have the area's truest putting surfaces. The layout stretches to just over 7,024 yards from the back tees. "We have several PGA Tour and mini-tour players play here regularly because of our exceptional greens," said Shawn Holmes, Eagle Dunes' director of golf. "We see guys like Chris DiMarco and Jim Thorpe here, and Zach Johnson used to play here when he lived in the area." The TifEagle greens at Eagle Dunes are a joy to play whether you're a tour pro, weekend warrior or a once-a-month player. Praised for their speed, consistency and playablility, TifEagle greens can withstand the stress of lower mowing heights and frequent verticuttings. 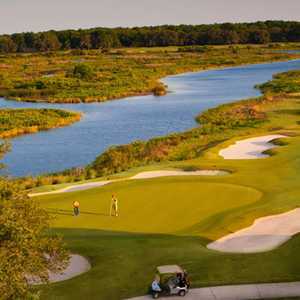 Set just outside the small town of Sorrento, about a 35-minute drive north of Orlando, Eagle Dunes draws golfers with its large, smooth, fast greens, rolling terrain, minimalist design and friendly staff. 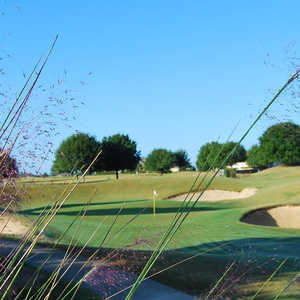 Opened in 2003, Eagle Dunes Golf Club was designed by Mike Dasher, who also fashioned Highlands Reserve Golf Club and North Shore Golf Club in the central Florida area. At Eagle Dunes, Dasher took full advantage of the topography dominated by sandy, flowing ridges, some tree clusters and a few low-lying wet areas. Dasher utilizes the sand in a variety of creative ways on the course with lots of elongated waste areas, traps and bunker complexes. Even to the untrained eye, it's evident that Dasher allowed the natural contour of the land to dictate the finished design. The rolling fairways and mounding look natural and not contrived. It's a straightforward course with everything in front of you. Wide fairways with generous landing areas, some greens with open fronts that allow for bump and run shots and only two holes with water are appealing elements to the play experience at Eagle Dunes. One of Dasher's strengths as a designer is his feel for incorporating a wide variety of challenges from bold par 5s to risk/reward, short par 4s, to fun-to-play par 3s. "The course has a great flow to it, and you're always excited to see what the next hole has in store for you," said Tony Miller, Eagle Dunes' merchandising manager, who has been at the course since opening day in 2003. From the back tees, Eagle Dunes plays to 7,024 yards (73.7/131). The next tees up, the Gold, measure 6,588 yards (71.6/124), the whites are 6,073 yards (69.3/119) and the forward tees can be played from 5,277 yards or 5,101 yards (70.1/114). You don't have to worry much about water hazards on the course, but the sandy waste areas and bunker complexes can balloon your score if you don't have much of a game from the sand. The wide fairways and excellent greens give low- and high-handicappers a chance to score well if the ball is kept in the short grass a majority of the time. "What's exciting is you can go real low or real high because the design never really lets you take a hole off," said Holmes. "You've got to have a concise strategy on every hole and know when to go for it or when to lay up." Holmes said the most talked about holes are a couple of demanding par 4s, the 437-yard 10th, which incorporates an elevated tee and an approach over water, and the 458-yard 12th. For those who love to play short par 4s, Dasher offered the 316-yard fourth hole and the 386-yard 13th. "One thing is for sure, you never get bored playing at Eagle Dunes because there are so many different kinds of holes," Miller said. Even though Eagle Dunes Golf Club is located only about 30 miles or so from Orlando, you feel as though you're hundreds of miles away from an urban center when you're standing on the wide-open fairways framed by rugged waste bunkers. Eagle Dunes is situated in the planned community of Sorrento Springs, less than 10 minutes from quaint towns such as Mount Dora and Eustis. The combination of a laid-back, upscale country setting with a visually beautiful and challenging course makes Eagle Dunes a great place to spend the day playing golf. Enhancing the experience is an amiable, helpful staff that seems genuinely appreciative that you took the time and effort to find and play this Lake County gem.